OK, corgi, here you go (although I'm sure you didn't really need me to start this thread for you). This is a separate thread for discussing the blocks puzzle from torment. If you need hints on levels before the blocks, please read the Tweleve torment thread. If your question is not answered by hints already given, please post a new question there. One of the players will answer you. Greengecko was a geocacher who also used an alternate name of "my precious" and had an unsolved puzzle called Child’s Play that also used a blocks puzzle. At least with that puzzle we know we need answer coordinates that will place us in Indiana. 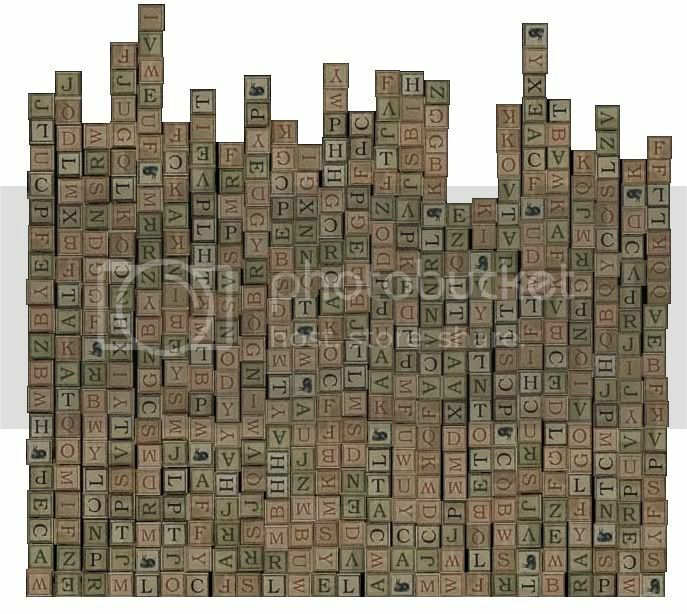 the letters on the blocks, reading from the bottom left going up the colums. one of my early thoughts is that the bunnies indicate something directional. 1. it is a numbers game, not letters. the placement of the bunnies as a number that can then be translated into a letter, or used in a set of coordinates. 2. it is a visual exercise. orientation of some letters is tricky (H, I, O). The O's all have the same orientation, however. how so? couldn't they be four different orientations that look the same? The orientations do not look the same to me however, I can see subtle shapings that led me to say the O's are all in the same direction. There are 476 blocks with letters and 19 blocks with rabbits - 25 blocks per rabbit plus 1 left over (the I on the tallest column? although that column has the same number of blocks as the other tall column). 476 + 19 = 495 = 3 x 3 x 5 x 11 = 15 x 33. Perhaps the blocks have to be rearranged, but what would be the rules to follow? There are 25 columns of blocks and the tallest columns have 23 blocks. 25 x 23 = 575. 495 blocks are shown. Does that mean we have to find the 80 missing blocks? The O blocks may be all the same orientation because of convenience in copying, but they could still be interpreted in any of the four directions. It might be interesting to work out how many blocks are clearly in each of the four orientations and then, if the numbers seem to be proportional to the number of rabbits in each orientation, try to allocate the other letters. Possibly there could be 25 blocks per rabbit (plus that extra one whichever one it is). Because we know the source of the blocks themselves I am inclined to think that colour is less important than the letters on the blocks. i just recounted the letters, and i got something totally different...hmmm...i'll check it again tomorrow, because i'm running out of time to do it today.